I’m talking up the cover story on Peter Frampton this month at a staff meeting with younger staff. “Peter … who?” the younger staff says. Who doesn’t know Peter Frampton, I start. Who doesn’t know THE album, Frampton Comes Alive! Who doesn’t remember the exact time, place and, possibly, activities they were engaged in the first time they heard Baby, I Love Your Way? People born after Frampton’s dramatic rise and fall in the 1970s and ’80s. People who remember the time, place and, possibly, activities they were engaged in the first time they heard Baby Got Back instead. People clearly not in PRIME’s 55+ readership demo. “Oh, THAT guy,” the younger staff nods. YES! The guy who wrote THAT song. The guy who performed it first on THE album that became the best-selling live album of the time. Wait. WHAT? I say. No! Not THAT guy. He can’t be. Googling as quickly as someone who remembers when Uncle Ben’s was the best-selling rice in America can, I locate the commercial on YouTube. I think about the influence Peter Frampton had on my life when I was younger staff. I remember the exact time and place for so many activities that were accompanied by his soundtrack. 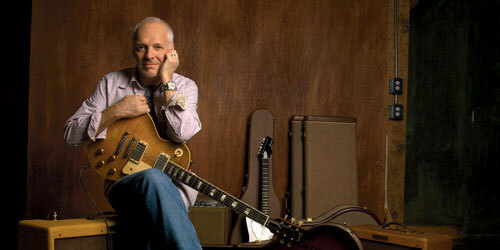 I go back and page through our cover story on Peter Frampton. He talks about disappointments, about stalled comebacks and life’s challenges; but about optimism and rebirth, too. Messages for all of us, I think, younger and older staff alike. Even if it means, I suppose, selling boxed rice. “Just when you’re saying that’s it, I’ve given up, I can’t do this anymore,” Frampton says, “passion reinvents itself. And, once again, Frampton comes alive.